Comes complete with Clicker to get you started! 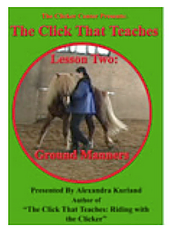 This is a three hour DVD which teaches you how to introduce your horse to the clicker and describes how to achieve good foundation behaviours to have a mannerly horse. 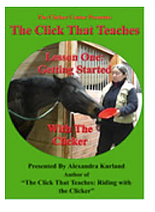 Watch beginners introduce their horses to clicker training. Does your horse barge over the top of you? Fidget and dance when you groom hom? Spook at his own shadow? Head lowering can be such a transforming exercise for many horses. Most of us know that horses tend to be calmer when their heads are down. This lesson does more than just calm a horse down. It helps to put an end to barging, rearing, bullying behaviour. It develops emotional control and stabilises the good behaviour we want. It is a key foundation lesson for all advanced training. 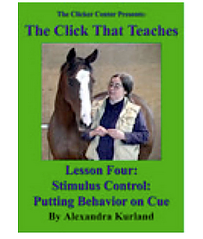 Lesson 4: Stimulus Control will show you how to teach cues, and how to use them to create a mannerly, focused, happy horse. We often hear the word “respect” used in the horse world, when you you hear respect, think polite manners under good stimulus control. 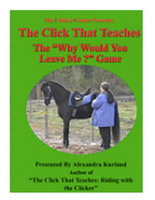 The “Why would you leave me?” game will show you how to have your horse do excellent lateral work at liberty. This is where you learn to teach your horse the basics of balance in movement. Teach your horse to stand in wonderful balance. This is the first step to having your horse bring balance to all his other work. It’s also a great start to teaching your horse to stand and stay quietly while you move away from him. 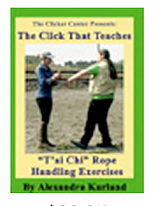 The “t’ai chi” style rope handling exercises featured in this DVD will improve your balance, help you develop a more secure riding position, and give you a better understanding of the lead rope as a communication tool. 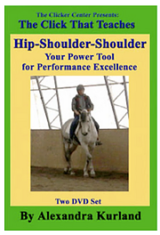 The step by step lessons presented in this dvd make it easy to teach your horse lateral work. Lateral work helps to steady your horse emotionally; it creates soft, rideable gaits; and it helps to maintain your horse’s soundness. Find out how to teach your horse lateral flexions using the Three-Flip-Three counted exercise in this two hour DVD presented by Alexandra Kurland. Muska is a young Icelandic horse who developed a fear of saddles after a riding accident. Follow her lesson as we use the power of cues to remove her fear of saddles. 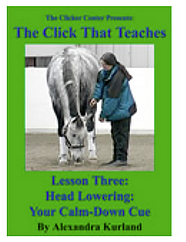 This two hour DVD shows you how to overcome a fear issue using head lowering; highlights the importance of mechanical skills; shows you how to build duration into your head lowering behavior; teaches you how to combine advance and retreat techniques with the clicker; how to read your horse’s body language; and how to recognize and use the cues that evolve during the shaping process. Learn how to see small details in movement and how to put those tiiny shifts in balance to work for you. Microshaping is “Equine Pilates” – Shaping for a Sound Spine. Learn what that means in this two hour lesson presented by Alexandra Kurland. Shaping is the backbone of clicker training. 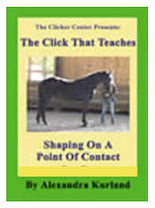 When we click the clicker to highlight a desired behavior in our horses we are shaping behavior. 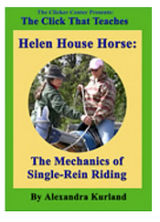 We are selectively reinforcing that behavior making it more likely that the horse will repeat it in the future. This lesson teaches great mounting block manners, plus it sets the stage for single-rein riding. The DVD is divided into two parts. 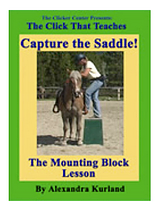 The first half focuses on the mounting block lesson. Once the rider is up, a very basic single-rein riding exercise is taught. 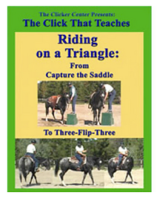 You’ll see the beginning steps that teach you how to ride on a triangle of the reins. Riding on a triangle is really the part two of the Capture the Saddle DVD. It will make much more sense if you watch the Capture the Saddle DVD before moving on to this lesson. In this lesson you will learn how to: Use cues as problem solving tools; Get a stuck horse to move; Develop the beginnings of lateral work and create a great riding relationship with your horse. While there are no four-legged horses in this DVD. By taking the horses out of the equation for the this lesson, the rider is freed up to concentrate on her own riding mechanics. We look in detail at subtle changes that can make a huge difference to the rider’s core security and the horse’s overall comfort. – What effect do they have on behaviour? – What long-term problems do they create? 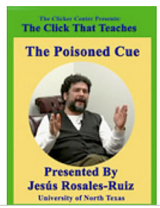 – Can you retrain a poisoned cue? This presentation is an expanded version of the lecture Dr. Jesús Rosales-Ruiz has presented at the Clicker Expo. 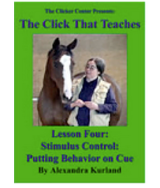 In conversation with Alexandra Kurland the poisoned cue is discussed both in general terms and then specifically as it applies to horse training. 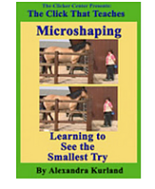 In the Microshaping lesson, you learned how to be a better visual obseerver. In this Microriding DVD you’ll learn how to be a better kinesthetic observer and learn how to become a grounded, connected, body aware, energised rider. 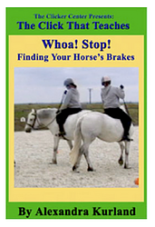 This 2 hour DVD teaches a basic safety lesson the creates reliable brakes without ever pulling back and blocking your horse’s spine. Clicker training happens in a loop: cue leads to behaviour, leads to click, leads to reinforcement leads to behaviour…… This lesson shows how training can be structured in a loop. It explains how you know when to advance in your training and how to build complex chains of behaviour. With nearly 6 hours of content in 3 DVDs, this is like a complete seminar that can be watched from the comfort of your own home.